One of the toughest things about owning a dog and working full time is knowing what to do with your dog while you’re away. If your dog isn’t house trained or might chew on the furniture, you probably don’t want to leave him loose in the house. But crates are cramped and take a lot of training for your dog to get used to them. 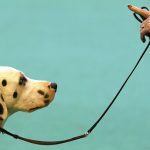 Outside of the United States, crate training is far less popular and might even be legally regulated. If you don’t want to leave your dog in a crate, but can’t leave him loose and can’t afford daycare, what are your options? This is where a playpen comes in. 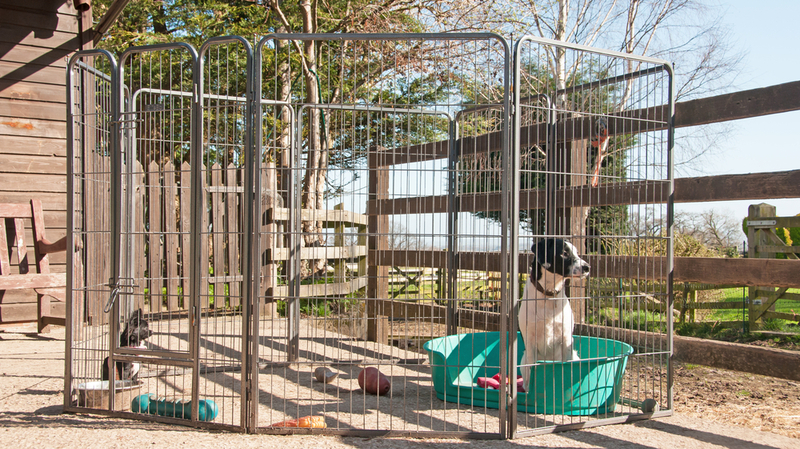 Playpens are perfect for large dogs and owners who like to give their dogs more space. Today, let’s look at what a dog playpen is, why to use one, and the best large dog playpens. What Is a Puppy Pen? A puppy pen is like a small, indoor fence. They come in a variety of sizes and usually can be fashioned into a circle or pressed against a wall in a D-shape. Some puppy pens come equipped with floors for potty accidents or roofs to deter vertical escapes. Puppy pens are also known as ex-pens, xpens, exercise pens, and playpens. A large dog playpen should be tall enough that your dog can’t easily escape, or it will need a roof. A good playpen will have enough space for your dog to sleep on a bed, drink water without spilling the bowl, and play a bit. Many people set up their dog playpens in the center of an easy-to-clean room, like the kitchen. 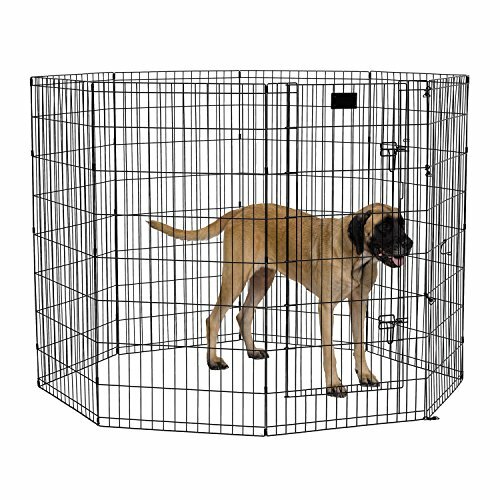 The exercise pen keeps your dog from chewing on shoes or peeing on the bed but allows your dog to have much more space than a crate would provide. Are Dog Playpens a Good Idea? Yes! Dog playpens allow your dog to have a lot more space during the day without getting into any trouble. A properly sized and arranged dog playpen gives your dog the ability to stretch, sleep, play, and generally move around. That’s a big difference from a crate! Most dogs tolerate being left inside of a dog playpen better than being in a crate because it’s a much bigger space. You can even leave a crate inside your dog’s exercise pen if he likes to sleep in there! Dog playpens require a bit more setup than a crate, though. 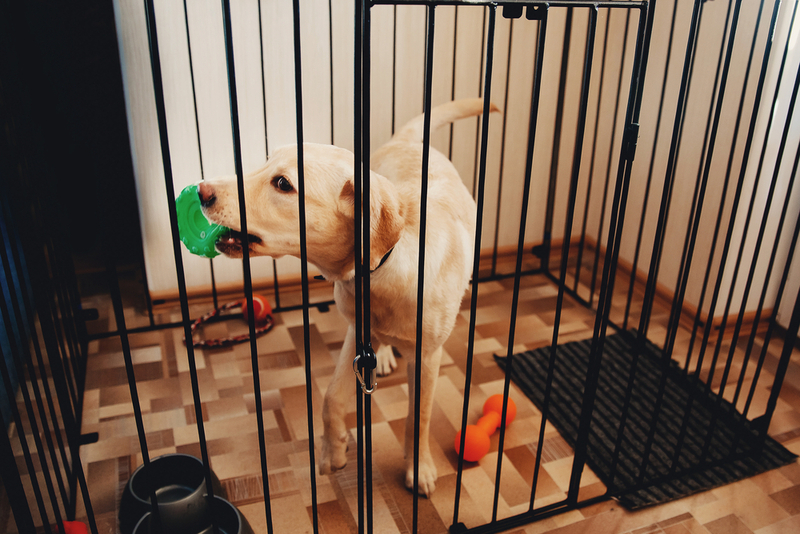 You’ll need to ensure that your playpen doesn’t allow your dog to easily escape (which will depend a lot on your individual dog’s physical skill and determination). A playpen cover will help. Some dogs also will push their playpens around, given the chance. This can scratch your floors and allow your dog to get into stuff through the barrier of the pen. If your dog is this crafty, you’ll need to be extra-careful in where and how you set up the pen. 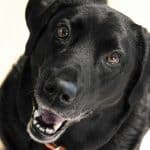 Even if your dog likes being left alone inside his crate, you might want to consider providing him with an exercise pen instead so that he’s got more space during your workdays. 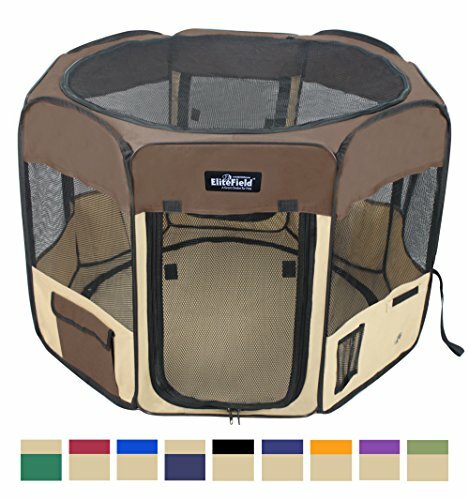 What Are The Best Large Dog Playpens? Here at Canine Weekly, we’re all about big dogs. Unfortunately, many playpens are designed for puppies or small dogs. But what if you want to contain a bouncy boxer or a chew-loving chow? These playpens are big enough to house and contain a large dog, but (mostly) not so huge that they won’t fit inside your apartment. We included a few options for outdoor large dog playpens as well. Unfortunately, there aren’t many great indoor options for large dog playpens. Many of the options below will require some extra work to keep them from falling over if your dog jumps against the side! There just aren’t many good options for big dogs. Description: This large dog playpen is in the classic “exercise pen” style. It’s available with or without a door and available in heights up to 48 inches. The pen requires no tools for setup and can fold down for storage when not in use. The seller recommends using it for pets up to 30 inches tall, which is about the height of a German Shepherd or Standard Poodle. Most users put some sort of matting or carpet underneath it for indoor use to avoid it scratching the floors. Please note that the image and product received may have slight design differences on the top of the pen. Height: Up to 48 inches. 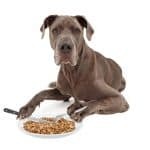 Pros: Users reported that you can (and should) purchase two or three versions of this and connect them for large dogs. The playpen is easy to expand in this way! Cons: This foldable pen can be a bit flimsy. Some users were frustrated that they had to put heavy things against it to keep their dogs from knocking it over or moving around. Many users reported that the gate wasn’t worth it in shorter models, though it’s hard to imagine the 48-inch version being very usable without a gate. Description: Very similar to the Amazon version of this product, this is a black metal grate playpen. It’s available in multiple heights, up to 48 inches. Like the option above, the Midwest Exercise pen has 8 panels that are 24 inches long each, making a 19-square-foot footprint. Pros: You don’t need any tools to set up this playpen. It folds down to a small size, though it’s suitable for large dogs. You can easily combine two or more pens to create a large dog playpen. Cons: Like almost all playpens, your dog can move this playpen by pushing or leaning against it. Users were a bit annoyed by needing to use carpeting or heavy objects to keep it from scratching their floors and falling over. Some resourceful buyers used zipties and PVC pipes to reinforce the corners so their dogs couldn’t push it over or push it around. Description: This heavy-duty exercise pen is more likely to withstand your dog’s paws than the last two playpens, and the price tag reflects that! 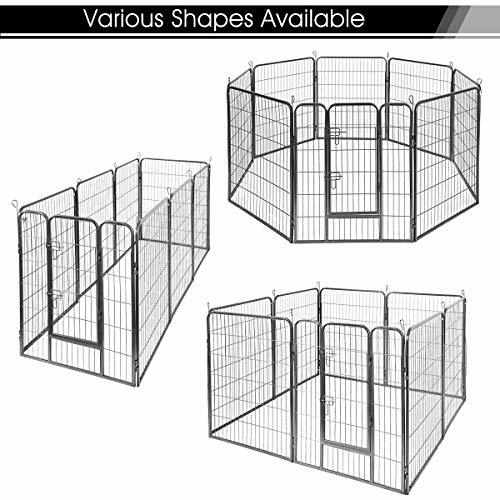 Like the other large dog playpens on this list, it’s made of 8 panels that are 48 inches tall and 24 inches long (each). It’s got a secure double-latch door and is quite a bit heavier than the two previous pens. Pros: Like other pens on this list, you can purchase several to link them together and make a larger space for your dog. Cons: At least a few users reported that the welded wires were flimsy and breakable – nowhere near as sturdy as advertised! This exercise pen is very heavy. 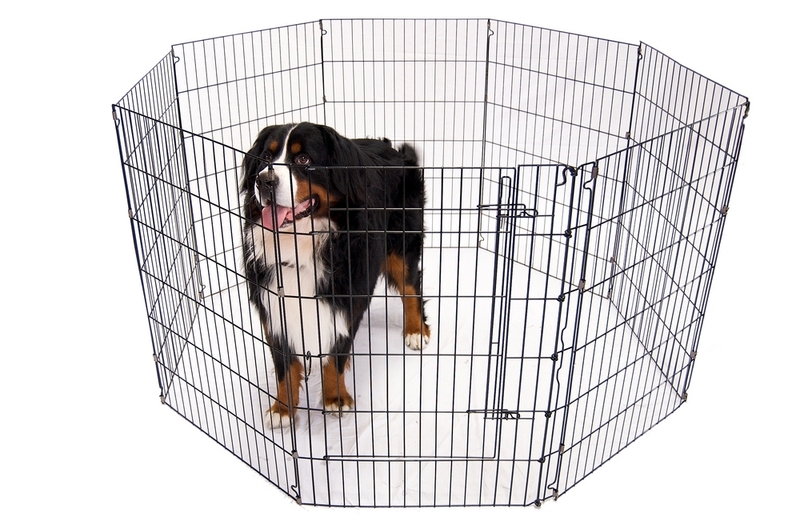 Description: Like the Iconic pet playpen above, this is a sturdier option for large dogs who need playpens. It’s very similarly-constructed and similarly-priced. It’s got a weatherproof coating, a secure double-locked door, and a tool-free setup. It’s a touch cheaper than the Iconic playpen and weighs half as much, so it might be an all-around better option. Pros: You can combine two or more to make a larger playpen for your dog. This product is lightweight yet sturdy. Cons: Like all the other playpens on this list, owners were irritated that their dogs could easily push the panels around on slick floors. The doorway on this product is also very narrow, making it hard to get in and out. Description: This soft playpen is suited for large dogs, but only temporarily. Unlike the other large dog playpens on this list, this foldable playpen is made for transport. If you’d like an exercise pen for agility trials or your next road trip, this is a great option. But its lightweight design and fabric aren’t suited for all day, everyday use. Pros: This is the best option for a transportable, ultra lightweight dog playpen. This exercise pen also comes with pockets and a free carrying bag – perfect for dog shows, trials, or trips! Unlike all the other playpens on this list, the EliteField pen comes with both a floor and a roof to keep your floors safe and your dog enclosed. Cons: This is not made for unsupervised use. Many unhappy owners found that their dogs could easily escape by breaking through the mesh if left unattended. 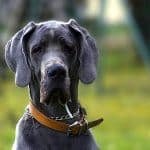 Keep in mind that if you’ve got a truly massive dog (looking at you, Dane owners), you might need to get extra creative! Most playpens that are suited for indoor use don’t get bigger than 48 inches tall, which won’t contain a bouncy or determined large dog. That said, there are several great options for playpen covers to keep big dogs contained! The Cool Runners sun/shade/security top will fit on most large dog playpens, keeping your dog from popping out. The GoGo 4×4 top is a bit less flexible but is made of thicker canvas if you need extra durability. Of course, it’s important to supervise your dog at first to ensure that he can’t jump out while you’re away at work. What Else Does My Playpen Area Need? Carpet or another flooring. Many of these playpens will move around too easily if you put them on slick wood, tile, or linoleum. A carpet will help protect your floor from scratches. Matting will also help reduce potty training messes! Stabilization. If your dog isn’t the type to lie quietly inside a container, you might need to reinforce the sides of these playpens. One user suggested zip-tying PVC pipes to the junctures of the pen, effectively locking it into place. You might come up with your own DIY solution! Crate and/or bed. Be sure to give your dog a comfy place to lie down and sleep within his playpen. Water. Give your dog a water bowl (or even doggie water bottle) to ensure that he doesn’t get dehydrated during the day. 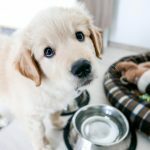 If your puppy is still getting potty trained, limit water without dehydrating your puppy – ask your vet for guidance here. Puzzle toys. Food-dispensing toys are like TV for dogs – they’re one of the best ways to keep a bored pup entertained while home alone! Simply stuff a puzzle toy with your dog’s kibble and let your pup play (and eat) till he passes out! Just like crate training your dog, teaching your dog to calmly hang out inside his playpen might take time. Be sure to make the playpen a great place to be! It’s far easier to teach your dog to like something than it is to convince him to stop hating it. Why do you love your large dog playpen? Did we miss your favorite product? Let us know in the comments below!